Kerry Sabberton, from our Thorpe Travel store in Norwich, took a cruise along the Croatian coastline and around the country’s islands in the Adriatic. Here’s what she got up to during her trip. The outbound British Airways flight was very good; check-in was smooth and the onboard staff were very friendly. We were served breakfast, which was ok. The return Easyjet flight was fine with friendly staff, but no food unless purchased. The ship looks very smart from the outside and doesn’t disappoint throughout. Cabins are all slightly different due to the shape of the ship; on the lower floor they are spacious and have room for a little dressing table and mirror. These cabins only have portholes that can’t be opened and are very high to look out of. However, they do have bigger bathrooms and would be comfortable for two adults. The main deck cabins (which I had) open directly out onto the deck. Mine was at the front of the ship, so was slightly small and, even though there were two single beds in the cabin, I think you would struggle to have two passengers in there at one time. The bathroom was very compact as it was right at the front. The cabin decor was white with just a splash of bright colour, which gave it a modern look. On both levels, on the port side, there is some noise as this is the side which moors to the shore. The dining/bar/lounge area was very nice, with bright oranges and high-back cream leather chairs to give it a very modern feel. This deck also has an outside area with table and chairs and, if the weather is not good, they have wrap-around sides to put up. The sun deck is lovely but very basic. It has lots of very comfortable sun loungers and when it is warm it is a lovely sun trap, but there is nothing else up there. The food and staff on board were amazing! How the chef manages to produce such wonderful food in the tiny kitchen is beyond belief. We flew from London to Venice and then had a three-hour coach transfer through Slovenia to join the ship in Rijeka, Croatia. Although it is a long transfer, it is a very beautiful area to drive through. We joined the MV Amelia and set sail for Krk Town on Krk Island, having lunch on the way. On arrival at Krk Town, we had an interesting guided walking tour. There is so much to see with the town’s history and amazing architecture and there are numerous places to stop for coffee, ice-cream and shopping. There is no traffic in the main area so it is nice and safe to wonder around and the people are so friendly. After some free time, we joined back at the ship ready to go to Vrbnik on a winery tour. On arrival at the Nada Wine Cellar, we were greeted with shots of Brandy. There were too unique flavours to try; Fig and Herb and a Grape Brandy which was a very warming 45% proof. We were given a quick tour and shown a short video about the winery and its history, before being treated to some wine tasting along with meats, cheeses and bread. The wines were very, very nice and we had an opportunity to buy some before we left. After some free time, we set off to our final destination of Opatija. We arrived mid-afternoon and had some time to wander around or have a swim. We all met back on board for the Captain’s Dinner with entertainment provided by Klapa, a group of amazing female singers who sing acapella. We then went disembarked the ship with the crew and had a taste of the local nightlife, which was great fun. The next morning, after breakfast, we said goodbye to the ship along with our lovely hosts and had a walking tour of Opatija. This place is gorgeous and somewhere I would definitely like to go back to. It has so much history and the buildings are amazing; a mixture of old and new. We then headed on to a local restaurant for some lunch before being picked up for our transfer back to Venice Airport. 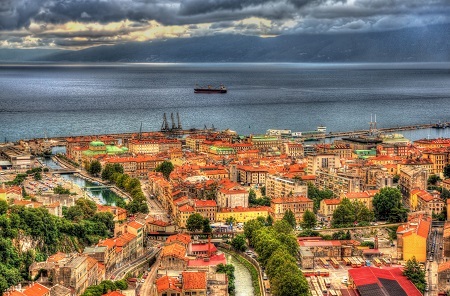 It is so hard to choose one part as I loved both Krk Island and Opatija. However, I think the trip to the Nada Wine Cellar in Vrbnik was special as it gave a sense of how they eat. The atmosphere was amazing, not to mention the lovely food and wine. I think they could improve the experience on board. It is a lovely ship but, apart from the scenery (which doesn’t change a lot), there is nothing on board to do when sailing between islands apart from sunbathe. It wouldn’t take much. Maybe some board games or even books, just to pass the time whilst relaxing. I would definitely recommend this trip, mainly because you get to see so much and the places you visit are amazing. However, it would not be suitable for anyone with walking difficulties as the ship has very steep steps. I would be slightly wary of the cabins too, as some of them are very limited on space. 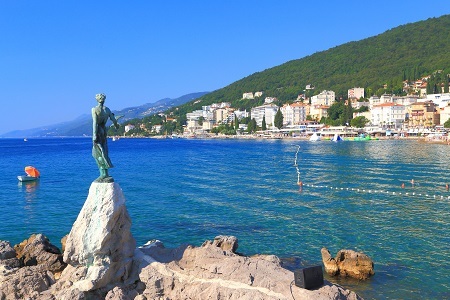 I would recommend Opatija as a short break destination with flights to Pula. This is definitely somewhere I would consider as an alternative to other city breaks and I hope to go back soon. I would like to say thank you to Fred. Olsen Travel for giving me this lovely trip and thanks to Titan and Louise Sword for a fab time! If you too would like to explore Croatia’s beautiful islands, then we can arrange a trip similar to Kerry’s. You can drop by one of our East Anglia travel agents, or those on the south coast, and speak to a member of our team directly.